The Marglobe tomato is an old heirloom variety with natural disease resistance that is an ancestor of many hybrid varieties. 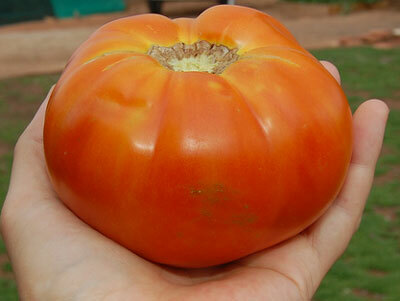 Its name was derived from its ancestors the 'Globe' and 'Marvel' tomatoes. It produces a heavy yield of fruit with a typical size of 8- to 10-ounces but can produce larger fruit as well. This tomato is one of the most vigorous and disease resistant of the standard tomato varieties. 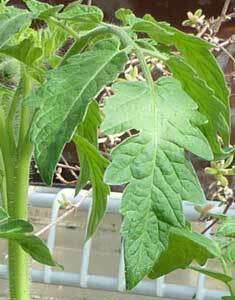 It is resistant to Fusarium Wilt and is said to resist tomato blight well even in wet weather. These tomatoes are globe shaped, smooth and bright red right to the stem. The Marglobe has also been noted for resistance to blossom end rot. The Marglobe plant is a determinate (bushy) vine that is very productive. Staking of determinate vines is optional but is still recommended in order to keep fruit off the ground. And because the vine is determinate, it means that Marglobe will produce all of its crop of tomatoes at one time, which makes it excellent as a canner or for market gardeners. Marglobes are vigorous and easy to grow from seedlings from your garden center or to grow from seed indoors. Planting tomatoes outdoors should be done when the soil warms. Recommended safe planting dates for many cities can be found in when to plant tomatoes.